Chile peppers are great, if you don’t mind the whole “sensation of pain” thing. By activating the TRPV1 receptor in an animal’s mouth, the capsaicin in the peppers “burns” and scares off most of the creatures that would otherwise enjoy munching on a colorful, crunchy source of vitamin C. Other animals, like birds with diminished TRPV1 receptors, can just eat chiles without knowing what they’re missing. The real weirdos in all this are the mammals that do experience that harmless bit of pain and then actively seek out more of it. While many humans certainly fall into this last category, the more surprising chile lovers were recently realized to be Chinese tree shrews. Tree shrews (Tupaia belangeri chinensis) don’t normally eat chile peppers, so it’s a bit odd that this connection was ever uncovered. 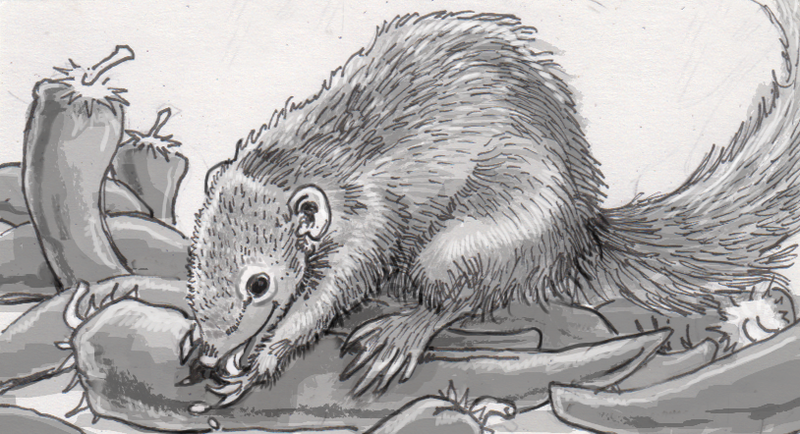 It started when researchers planning to use the shrews in medical experiments were looking for the animals’ preferred foods, apparently “stumbling” upon the fact that the rat-sized mammals would eat a pepper without the slightest hint of discomfort. In fact, when given the option of corn snacks with or without spicy infusions, the shrews actually preferred hotter blends over blander options. This was in direct contrast mice in the same facility who notably recoiled from any food with spicy capsaicinoids in it. Aside from the shrews’ overall interest in eating peppers, this gap in the two critters’ reactions wasn’t completely surprising. Despite their name, these tree shrews aren’t rodents, being more closely related to primates like us than to mice, which is why they were of interest to the laboratory in the first place. That said, the real difference in how each animal experienced capsaicin came down to only a single amino acid missing from the shrews’ TRPV1 receptors, making it slightly more difficult for the spice-triggering molecule to do its job. Essentially, the shrews could still taste the spiciness, but just less of it per bite. Of course, this would be of little use if the shrews never needed to eat something spicy. Without peppers in their natural diet, it’s assumed that the shrews evolved their taste for capsaicin by eating Piper boehmeriaefolium. These plants also produce capsaicinoids, and the shrews may be the only creature evolved to eat them. This has essentially forced the two organisms into a partnership, where the shrews have access to a food source nobody else has the tongue to tackle, while the plants rely on the shrews to scatter their seeds. It’s unclear if this leads to the enjoyment capsaicin-loving humans get from eating spicy food, but the shrews did show a preference for foods that burn like their favorite P. boehmeriaefolium plants they grew up with.